Major Attaway as Genie in Aladdin. Photo by Matthew Murphy © Disney. A Whole New Season of Broadway! Click below to download an order form for the 2019-2020 season. The deadline for current season ticket holders to renew their seats is May 11. Before seeing the shows, get to know the season by listening to this compilation featuring hit songs and fan favorites from the upcoming season. 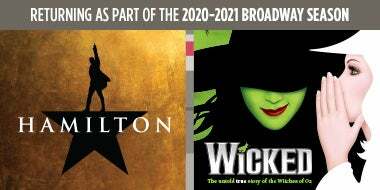 Subscribers are guaranteed Hamilton and Wicked seats when renewing for the 2020-2021 season. Dates and ticket sales information will be announced at a later time. Join us June 15, 10 am – 12 pm, or June 18, 5:30-8 pm in the Peace Concert Hall to hand-select your seats for the season and tour the Peace Concert Hall. Heartwarming journeys of hope and wonder. Characters who display unwavering faith and perseverance. Memorable music that sparks pure imagination. Inspiring stories that last from generation to generation. 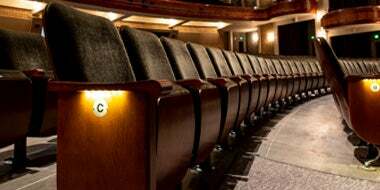 Packed with award winners, fresh revivals, and fan favorites, the 2019-2020 Broadway season at the Peace Center is specially designed for everyone who loves the spectacle of Broadway. Featuring a record ELEVEN shows, this is Greenville’s biggest season yet. We hope you will gather your family and friends and experience this remarkable season with us. Peacekeepers may purchase up to TWO Premium subscriptions per $250 donation. Box seating is available with annual gifts starting at $1,500 for upper boxes and $2,500 for lower boxes. Gifts must be renewed annually to retain season tickets in this section. Please note, due to demand, this seating area is limited. The Peace Center offers a variety of accessibility services including assistive listening, ASL interpreted performances (Saturday matinees), audio described performances, wheelchair accessible seating, and transfer chairs. For the best experience, please discuss your specific need with a Customer Service Representative. Some services require advance notice. Show after show, the seats you choose are yours. Want to upgrade? Season ticket holders always have priority. As a season ticket holder you receive the best prices up front. When single ticket prices increase, you don’t pay more. * Plus, subscribers save by only paying one $15 handling fee per package. 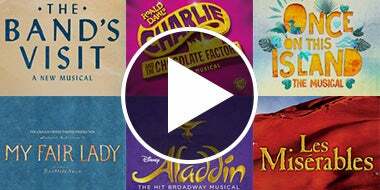 Purchase additional tickets to Broadway shows before they go on sale to the public. Be the first to learn about our new season at the annual Broadway Announcement Party. Our extended payment plans make Broadway budget-friendly! The earlier you subscribe, the more options you have. *Subject to availability. Season ticket holders may exchange their tickets for another night within the same title with at least 48-hour notice prior to the scheduled performance. If moving to a higher priced seat due to day, location, or price increase, customers are responsible for paying the difference.